Professional wrestler Roman Reigns has announced that he is stepping away from the ring to focus his energies on fighting leukemia. Reigns, whose real name is Leati Joseph Anoa’i, announced on Monday, Oct. 22, that the cancer that he had been living with for 11 years had once again reared its head. The World Wrestling Entertainment (WWE) contract fighter broke the news to fans in a moving speech in Rhode Island at the beginning of WWE’s Monday Night Raw show. “When I was 22 years old, I was diagnosed with this. And very quickly I was able to put it in remission. But I’m not going to lie, that was the hardest time in my life. 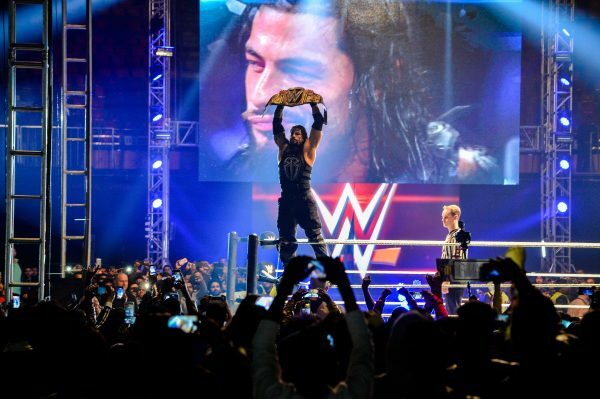 I didn’t have a job, I didn’t have any money, I didn’t have a home and I had a baby on the way,” Reigns said. The former professional football player thanked the WWE for giving him a chance after he was released by the Canadian Football League’s (CFL) Edmonton Eskimos in 2008. After signing with WWE in 2010, he became one of the promotion’s most prominent wrestling personalities. Reigns went on to win several titles, including the WWE World Heavyweight Championship three times and the Universal Championship once. Reigns then vacated the WWE Universal title and laid his belt down in the ring. The fans erupted in applause. WWE has released an official statement after Reigns’s emotional cancer revelation. “Tonight on Monday Night Raw, Roman Reigns (aka Joe Anoa’i) announced that he is relinquishing the WWE Universal Championship and taking a leave of absence from WWE as he once again fights leukemia, which had been in remission since late 2008,” according to The Sun. He received support from some of the biggest names in wrestling. “You have given us your everything including a courageously vulnerable moment. We, your WWE family, give you all of our love and support,” John Cena tweeted. WWE tweeted a video of fellow wrestlers offering hugs and words of encouragement for Reigns after he made his way backstage after his speech. “Moments after announcing that his returning leukemia has forced him to relinquish the Universal Championship, @WWERomanReigns is met with an outpouring of support backstage,” WWE wrote in the tweet. Leukemia is a type of cancer that typically starts in the bone marrow and causes large numbers of abnormal blood cells to be produced and enter the bloodstream, according to the National Cancer Institute.